I don't know about you, but I'm pretty sure I open more bottles of wine in December than I do at any other time of year (and that's saying something), so what do you do with all these extra corks you've got lying around the kitchen/cluttering up the draw where you keep the corkscrew? MAKE THEM INTO BRILLIANT CHRISTMAS THINGS, OF COURSE! There are already dozens of wine cork craft bloggers out there who have been busy getting creative over a bottle of red, and I'd like to share some of the best ideas I've found so far, just in time for the proper festivities to start. 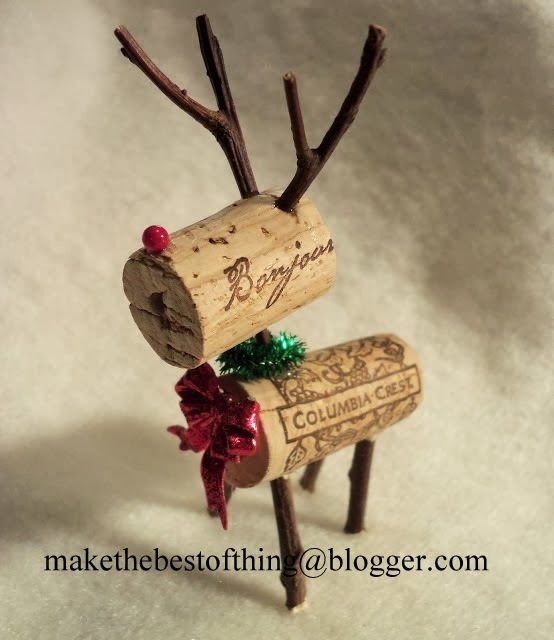 My lovely friend Emma sent me a link to the amazing Make the Best of Things blog last month because she'd found a post about creating the most beautiful wine cork reindeers. The lady behind this blog is an inspiration, continuing to craft even when she was undergoing treatment for breast cancer, and these reindeers are a testament to the way she makes crafting easy and fun and daft all at the same time. Have a look at her amazing how-to guide (it's so easy to make the reindeer! ), and like her on Facebook. There are about a billion wine cork wreath 'how-to's on t'internet, but two in particular are both pretty and achievable. 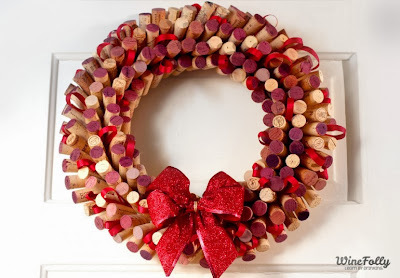 The bloody brilliant Wine Folly website posted this gorgeous red wine cork wreath last year. I love how they use the fact that cork from most red wines have a stained purply-red bum and incorporate it into the design - it's lovely. Besides, Wine Folly is one of my favourite sites in the world. If you're more of a white wine drinker (or like painting stuff) you'd probably prefer the blue and glittery wine cork wreath from DIY Real. The instructions are so easy that you really can't go wrong. This might be my favourite thing to do with corks, to be honest. It's just SO PRETTY! Wooden Bee is a blog run by a husband and wife team from Florida who have a real talent for wine cork crafting. They even sell their beautiful designs on their Etsy store (HOW many people do I know who I could buy presents for there?!) 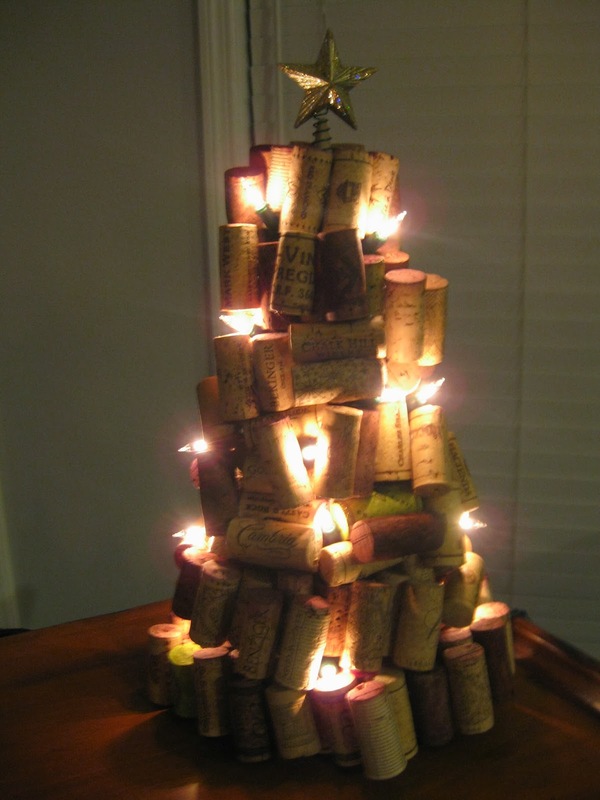 but they're generous enough to share the secrets of some of their designs with the world, including the wine cork Christmas tree. Of all the designs, I was most tempted by this one - how could you resist having one of these on your windowsill? There are many a Christmas tree cork ornament idea to be found in the ether of the Christmas bloggers, but none are more stunning than this cork bauble. The amazing idea can be found on the wonderfully crafty Changing my Destiny blog - she is very clever and makes everything look way too easy. Okay, this one is probably the trickiest to do (you know yours is going to look ROUGH in comparison to the picture) but sooo worth a try, no? Especially if you've open a bottle especially (and are half way through it...)? 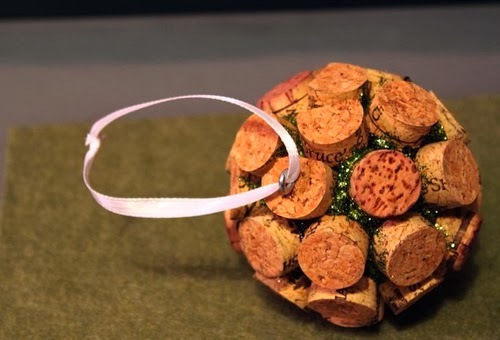 What will YOU be doing with your corks this Christmas? Tell us tell us tell us! EXCELLENT formula! I've began producing my very own washing soap just lately -- as well as like it -- however do not have the pretreatment squirt -- They are SIMPLE elements as well as I will provide this particular an attempt!!! Many thanks with regard to publishing this!